I have little background knowledge of knives and even less experience with sharpening. I recently did some googling of your older articles to learn a bit more about these topics. I'm in the market for some solid kitchen knives. It looks like buying some used Global knives on eBay might be a good way to get some high quality steel. I would likely purchase the CRKT Slide Sharp (based on your recommendation) and attempt to learn to sharpen. The other possibility is a ceramic knife, since these kitchen knives shouldn't ever be prone to "abuse". Which would you recommend? More interestingly, though, I'm looking to purchase an every-day-carry foldable knife for my Dad. He has a long history of buying $20 pocket knives and shortly destroying them. He uses them to pry, chisel, stab, cut, and occasionally as a makeshift screwdriver. I've done some brief research on the topic and heard some names like "Strider" tossed around. I'm OK with spending some decent money to get a knife that will withstand this sort of abuse (and ideally have a warranty of some type). What would you recommend in this situation? If you're going to be using the knives a lot then you might want to try a few different types, though. Not only are there umpteen blade styles, but some people prefer Global's unusual seamless ovoid handles, some like traditional Western handles that're a riveted sandwich with a full tang in the middle, and some people prefer the circular traditional Japanese handles. If you're buying used knives that you're probably going to have to sharpen before you use them, though, you should practice on a cheap knife or three before assaulting a nice one. Yes, it is possible for a complete amateur to to screw up even when using a guide jig, and the faster a given sharpening system works, the faster you can screw up. The Slide Sharp jig is pretty close to foolproof, but because it's based on ceramic "crock sticks", it's no good for sharpening a really blunt blade. It'll do it eventually, but it's much better to start with a cheap coarse stone to put something approximating an edge on the blade. So go to the dollar store and get yourself a cheap coarse stone or some suspiciously cheap alleged diamond cards, and the cheapest knives they've got that are actually physically functional. This mainly just means the knives need to have a a proper tang - steel extending from the blade - down the middle of the handle, not just some dinky glue joint; I don't know what the cheapie-stores are like where you live, but the one in my town doesn't have any really worthless knives. You'll probably find Western-style kitchen knives in a discount store, and quite often also small knives and cleavers using the single-sided Japanese chisel grind. The only thing really wrong with super-cheap knives, provided they have a proper tang, is that they'll go blunt faster than a fancy knife. But that means they're faster to sharpen, too, and it also means you can just chuck them in the dishwasher and not worry about them maybe bouncing against a glass and denting the edge. "Oh no, my two-dollar knife is dented." (Update: To make sure the above claims remain true of, at least, my local Go-Lo, I just bought a boning knife with a six-inch blade there, for $AU2.49. Full tang, good handle, and a good factory edge everywhere but on the tip, which is a common problem for cheap knives and easily remedied. All in all a perfectly satisfactory piece of cutlery even without touching up the tip, for marginally more than the price of a McDonald's cheeseburger. Update 2: After about a year of use and numerous trips through the dishwasher, it's become apparent that the "rivets" holding the handle onto this super-cheap knife are just disks of metal glued onto the side of the handle. One has fallen off. So there's glue holding the handle and blade together, instead of real rivets, but it's still holding on fine. It'd be easy to re-attach the handle "scales" to the sides of the blade if they ever do come loose. Here's an illustrated article about the handle of a knife with real rivets, in case you're wondering what I'm talking about. You can get off-brand knives of decent quality quite cheaply, too. I like the ones Aldi supermarkets sometimes sell along with their other limited-time loss-leader products; their santoku-type knives have a good thin profile and those little hollows in the sides of the blade to stop sliced food sticking to the knife, and you can get a small one and a medium one for less than $US10. You may be able to find similar bargains in kitchen-gear or department stores, if the salespeople don't manage to steer you towards higher-margin European brands. If you sprinkle a few carefully-chosen search terms on eBay, you can find quite a few decent-looking and cheap kitchen knives there, too. The one other piece of advice I have for the kitchen-knife novice - not that I'm very far above novice status myself - is that you should never use a sharp knife on a glass cutting board, ceramic plate or stone tabletop. Cutting on a metal surface isn't a great idea, either. Glass cutting boards are wonderfully hygienic, and they're fine for cutting cheese on with a blunt knife, and they're also OK for the average domestic chef, because the average domestic chef has nothing but blunt knives anyway. Glass cutting boards might even be all right with ceramic knives, though I doubt it. They'll definitely instantly fold over the edge of a sharp steel knife, though. Use wooden or plastic cutting boards instead; plastic is the more hygienic. On to the subject of your knife-torturing father. No folding knife can be anything like as strong as a fixed-blade knife for levering and prying and such. Some fancy folders are a lot stronger than you'd expect, but it's just not possible to make a hinge that's as tough as a piece of solid metal. The street price for the knives in that video is pretty high, though. Alleged "Zero Tolerance" knives go quite cheaply on eBay; I suspect most of them are knockoffs. That's not necessarily a disaster, though. Just because the steel's cheaper and the machining's less precise doesn't mean a knife will be easy to break. The only knockoff knives I'm really leery about are liner-locks and their relatives the frame locks. These must be made precisely, with hard steel in the right places, or they may close on your hand during a push-cut. ...as a folder that fits in a pocket can possibly be (you name it, and someone on YouTube will be obsessing over it! ), but I don't know anything more about them than that. Strider also make fixed-blades, which is really what you've got to get if you want to get as close as possible to indestructibility. Umpteen companies make different versions of the single-edged fixed-blade "combat knife"; a small one of those would suit your dad, if he doesn't have to have a folder. If he must have a folder, I'm torn between suggesting some expensive chunky US-made "tactical" folder that preferably didn't hit too many branches when it fell out of the Mall Ninja tree, or just a hatful of cheap Chinese folders. Abuse will kill any folding knife eventually; if it only cost eight dollars in the first place, though, who cares? You can also get cheap Chinese knockoffs of every oddball folding-knife innovation, which is a cheap way to make a fun little collection of things that'll make you bleed when you play with them while drunk. Columbia River Knife and Tool, makers of the abovementioned Slide Sharp kit, are known for their range of folding knives that open and close in peculiar ways. My own everyday pocket knife is a CRKT Rollock (now discontinued). Like many novelty folders, the Rollock doesn't really work any better than a normal folding knife - actually, it's slightly prone to close unexpectedly, or try to open in your pocket, and it's definitely not going to win any abuse-tolerance prizes. But it's cool, with no mall-ninja ballistic carbon-fibre tactical BS. If you find something on eBay that's described as a CRKT or Spyderco or Strider or some other big-brand knife, and looks just like it, but costs a fifth as much, it's a knockoff. Some knockoffs are crap, many - often the ones that don't try to look exactly like a given big-brand knife - look and feel fine, and some are almost indistinguishable from the real thing. I review an excellent example from the obviously-a-knockoff category, here; it shares only its general shape with the Boker original, and is an excellent tool for the money. I also once bought a couple of knockoff CRKT Glide Locks on eBay. They look exactly like the real thing, but one of them fell apart in a week. It also occurs to me that a person who keeps abusing a knife by using it as some other kind of tool could, perhaps, be in the market for a multi-tool. I think the toughest of the Leatherman/Gerber-type plier-multitools is the SOG PowerLock, and there are of course many others. SOG also just released the PowerDuo, a plier-type tool with a full-size knife blade. 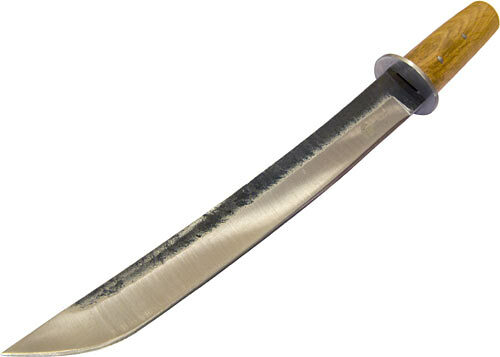 If you want the knife to be the main tool with other stuff less important, then a hollow-handled fixed-blade "survival knife" could be a good idea. The hollow handle doesn't have to have matches and tinder and fishing line in it, after all; you can pack other tools, like a real screwdriver for instance, in there. The overwhelming majority of hollow-handle knives are garbage, because they have no tang to speak of and just glue connecting the blade to the handle. Until recently the only good options in this field were expensive models forged out of one piece of steel, but now the overgrown teenagers at Cold Steel have made the Survival Edge, which is big enough to be useful without being so large that it's a ridiculous Rambo knife, and whose plastic handle is moulded around the short tang of the knife. ...that does not seem to be the case. It's the thick end of fifty US bucks delivered, but comes with a polymer sheath and sharpening doodad, and if the above video can be believed, will probably last approximately forever. The Survival Edge is also new enough that none of the ones on eBay should be knockoffs. Just bought this at dx. Quite usable as a screwdriver with a good selection of bits (how well they hold up to abuse remains to be seen). The liner lock didn't engage properly the first few times I opened it but seems to have worn into place since. The blade came razor sharp and seems of decent quality for the price and although the handle isn't the most comfortable thing I've ever held it's far from terrible. If it had a flashlight it would be the only thing I needed to carry (anyone know of such a thing?). I bought some cheap ceramic knifes from DX, after I snapped my expensive kyocera in half. (Friendly hint - don't use ceramics to pry apart frozen sausages...) While they're not quite as sharp as the Kyocera, they have held up pretty well. And they cost less than a tenth. > Use wooden or plastic cutting boards instead; plastic is the more hygienic. Another benefit, not mentioned in the linked article, is that when your wooden cutting board gets hacked up after a few years, you can take an orbital sander to it and make it like new. Can’t do that with a textured plastic board. I actually came to mention that very thing. The original research was done at U.C. Davis, and is one of my very favorite pieces of scientific research to date. Our research was first intended to develop means of disinfecting wooden cutting surfaces at home, so that they would be almost as safe as plastics. One more thing about ceramic knives... While it's true that they don't go dull, they chip very easily if used on anything but a softish cutting board. The first tiny chips don't actually matter, and can actually make it easier to cut certain things, like tomatoes, where a slightly serrated edge helps. But with increased (ab-)use the edge starts to become less useful. This process is pretty slow though. My Kyocera was my favourite knife for several years (5? ), and it was still cutting very well when it snapped. Being able to baton with a blade and not have the blade and handle part company isn't really a useful benchmark of durability. Much of the success (and safety) of batoning is in *technique*. A typical newbie mistake is to get a death grip on the handle and try to bear down or rock the blade into the material, helping it along. This is how you break tangs. Instead the handle should be held loosely and all the work should be done by the baton, transmitted through the spine and to the edge. The handle is only there to aim the blade before the baton strikes. Funny you should mention that, I managed to snap a steak knife about 3 hours ago cutting a chunk off a block of cheese. Specifically using the bear down and rock the blade method. Snapped the tang off about 10mm into the handle. It served well for 15 years or so. Indeed. I have seen many, many pictures of knives broken from batoning where this has obviously happened. Many of these knives were pretty solid too. That said, use an axe. Or a machete. Or a kukri. Or a... You get the idea. If you want to chop wood, use the right tool. I can't help thinking that a small file fashioned into a knife, perhaps with a screwdriver tip on it would work wonders. This is a rather long-winded instructable, the upshot is, use a file for the blade, use a fiberglass hammer handle for the handle. Unless you're really good, the moment you take an angle grinder to a file, or a sander set at high speed, you're going to ruin whatever heat treatment the file had. This will change the properties of the steel and is bad. Unless you heat treat the blade again. But you'd have to know what you're actually doing for that, as well as what steel the file is made from.